This is a very fun list to play, but it's far from an optimal one. It lacks e.g. Shahrazad and Wheel of Fortune, the Swords are far worse than Chain Lightnings here, and it is kind of unfocused when trying to support both combo, aggro and and hate in a single deck. "What is this strange card type? Cre-a-ture?". Stalin is confused during Gråberget Champs 2012. 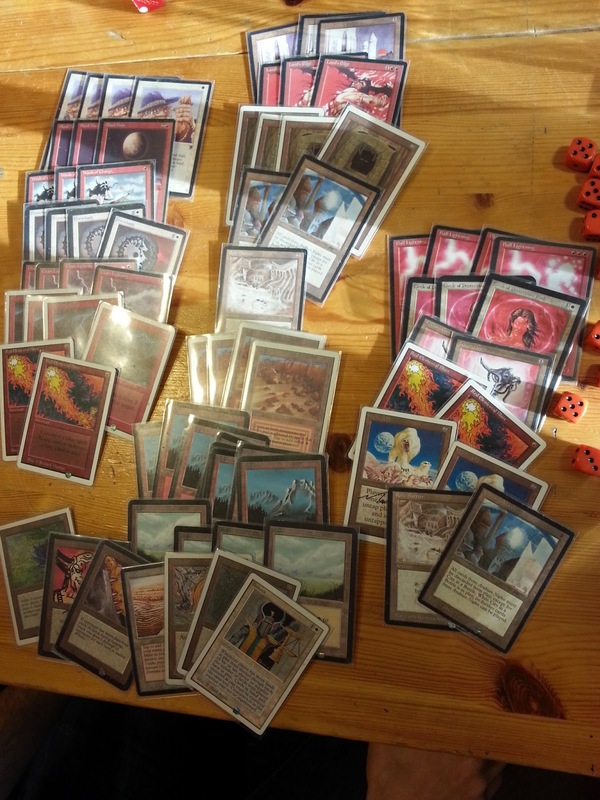 A creatureless version of the deck was first shown off by Gustav "Tysken" Schmidt at n00bcon 4. This deck supported Howling Mines and Ivory Towers, and used Feldon's Cane to avoid running out of cards to throw at the opponent. Gustav took the deck to the top8, and the story goes that he only lost games where his opponents managed to activate Mirror Universe. When he can't play Juzam himself, at least he got his Sol Ring altered to a Juzam. I'm fairly certain that it's correct to play Howling Mines in the deck regardless if you want to support a few creatures or not. Honka's choice of playing no creatures maindeck but having access to 4 Ball Lightning in the sideboard is very nice and techy. I personally like to have a few panic buttons like Serra Angel in the deck, but it's probably a smarter move to make all the opponent's creature removal dead. It looks like there will be a 93/94 tournament at Warcon this year as well btw! Varberg is the hometown of players like Viktor "Oldschool" Peterson and Elof Gottfridsson so I'm sure that it will be a sweet gathering in six weeks! "Why can't we play Type 1 with ONLY *older cards*?" 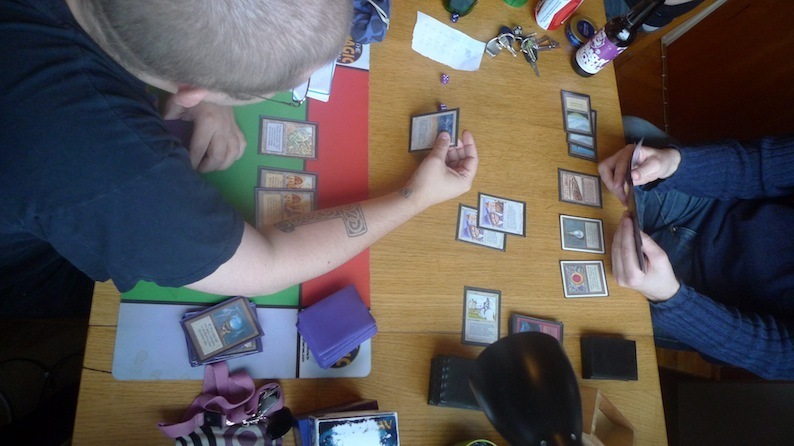 And voila, some genius has created a tournament scene around this very idea. Well done! 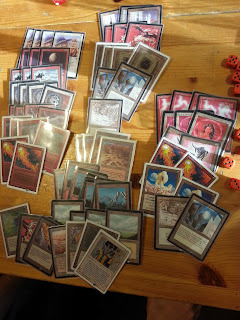 After fourteen years, I'm putting the deck back together as Tax/Edge. Since Land's Edge costs 1RR, it makes sense to try out a predominantly red, aggressive, fast-paced build. I was thinking of using many of those same cards: Ball Lightning, Chain Lightning etc. Can you tell us anything about how Winter Orb and Howling Mine would change the speed of the deck? The Winter Orb strategy makes you want to play a much slower game. The Tax Edge deck that placed higest during last n00bcon slowed down the game to something akin to stasis (while surviving with Ivory Towers and Library of Leng), and only had two Land's Edge and one Feldon's Cane as wincons. I think it is correct to play a few Howling Mines in most builds of Tax Edge, where the more midrange versions maybe plays just two and the more controlling ones have the full set of both Howling Mine and Relic Barrier. It's very much about taste though, i prefere the slightly more agressive builds myself. The last build I played is very similar to the build here: http://oldschool-mtg.blogspot.no/2013/12/thunder-taxedge.html with some changes (Md: -1 Blood Moon, -2 Plains, -1 Thunder Spirit, -1 Detonate; +1 Stone Rain, +1 Mountain, +1 Plateau, +1 Winds of Change, +1 Land's Edge). Sideboard had some stp's, but no knights. It's presumably not the best possible build, but it worked pretty well. Thanks for your reply, I was thinking along the lines of what you mentioned. I don't know if I'd use the Orb, it's just not my style... Howling Mine sounds fun in a fast-paced deck that has other ways to win than the Tax/Edge combo, but still focuses on getting that Land Tax out as early as possible while minimising lands in play. That's a gorgeous deck, by the way. :) Mine will be ready in about a year's time, as I insist on getting everything black bordered. Keep up the good work guys, you are slowly gaining an audience in other countries.